Softening of outer Earth and “surface-only” oriented beings occurs at this time. This may be reflected and/or caused by various weather and surface-crustal shiftings, as well as personal/individual shifts of the so-called “unexpected” nature. Higher Guidance and Higher Level Beings assist with this softening, as individual soul contracts must be honored. Paradigms formerly “unyielding” to all human efforts to remedy, will find softening, resolution, and revolution. Collapsing shadow forms (“dark” entities) seek retrieval of energies via reverse vortex rotation at local and individual levels. Disruptions in “standard” 3D-4D surface Earth operations and services may result, depending largely upon status of individual and group consciousness levels at those locations. Resistance of such reverse vortices only strengthens the intensity of such, whereas rising above such vortices dis-empowers them. Such situations are temporary only and persist only as long as the individual or group continues to hold on to them, or resist them. Be with the Higher Light. Be in the Higher Light. Alignment and attunement with Gaia Central is called for at this now moment. Inner Enlightened Earth calls for alignment and attunement, in particular, with dissolution of non-Gaia-serving “protocols” and “paradigms”, and formation of Higher Gaia protocols and paradigms. Alignment and attunement with Essence is essential. 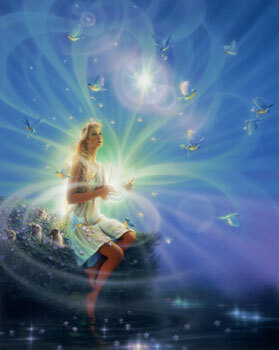 Shimmering sparkles of Higher Energetic Dimensions are appearing to many, as 5-7D Gaia presents herself in anticipation of humanity recognition. All aspects of “humanity to Hue-manity” mass transition have been initiated and progress appears as anticipated, although extremely slowly for some. High degree of care for those with fragile “shock” layers is being called for by Gaia at this time. Many of Higher Realms are active on Gaia surface and Gaia Inner Realms as full awakening process begins in earnest. All is proceeding as desired. Synchronizing of all participants on all dimensional levels occurs, as participant group consciousness has risen sufficiently to support such synchronization. Transformational energetics are fully activated for those requiring such in the next few days of the time domain. All Hue Beings are currently aligned with Gaia ascension transformation pathways. Energetic couplings and finalization of Gaia portal connections into fully operational 5-7D planetary grid are in process at this now moment. Such connections and couplings have been designed for New Paradigm multi-dimensional manifestations and will be experienced by multiple Light-aware and non-Light-aware beings, across planetary surface, as well as throughout Inner Gaia realms. What some might term “mass awakenings” will occur in due time, yet for each individual human unit will manifest appropriately for their individual consciousness level. The “Might of the Light” will be seen at individual and “mass” levels, and will not be deniable. Individual and “mass” Higher D strengthening is experienced at this time, whether fully aware or not. “Explosions of Light” are here… Now. Energetic “infernos” envelope the planet at this moment. Numerous “fire” type manifestations may thus be observed at various portal locations throughout the Earth surface. Gaia Essence is unaffected by these “inferno” energies as that [Gaia Essence] is of a Higher Dimensional structure. Yet she has “approved” of these in order to cleanse 3D 4D earth surface and underground of veiled dark (shadow, negative) constructs which have served their purpose. Some of these have displayed a reticence to leave the Gaia collective, and thus the “inferno” manifestations. All ascension protocols at all levels have been evaluated and agreed upon at the Highest Planetary manifestation levels, and will enable Gaia to enter her final correction phase within the 2013 time frame.